Full of facilities in the villa! 4 Bedroom rental villa. 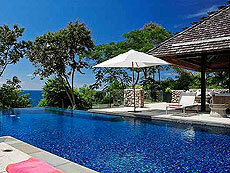 Leelavadee villa located in Samsara Estate at Kamala beach area. Leelavadee villa is gracefully clinging to the edge of a private peninsula, features elegant design with rich furnishings and stunning views over Patong Harbor. Inside the villa has full facilities for Home gym, sauna, pool table. Wonderful sunshine outdoor decks with private pool, outdoor dining area include a built-in BBQ and poolside sunning area. A private outdoor Jacuzzi adjoins the master bedroom. You could have a luxurious stay in Phuket with Leelavadee.